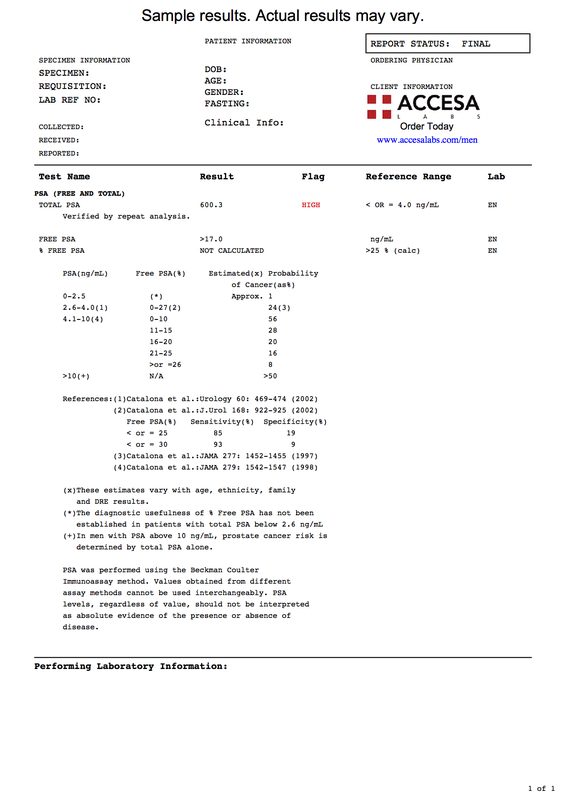 The PSA free and total test measures the PSA total and free blood levels. What is a free & total PSA test? The PSA free & total blood test measures the PSA total & free blood level. Why is a PSA free & total blood test important? The free & total PSA test provides a more detailed evaluation of prostate health. This PSA Free & Total Test is a blood test. This PSA total & free test, also known as a PSA free and total blood test, bioavailable PSA test and a prostate-specific antigen free and total test, measures the total and free PSA blood levels. The PSA free & total lab test builds on the total PSA test by measuring the free portion of PSA, or prostate-specific antigen, in addition to the total PSA level in the blood. The free component of this PSA test represents the bioavailable portion of the prostate-specific antigen in the blood. To get from where the PSA is made to the tissues it exerts its effects on, PSA is transported by carrier proteins in the blood. However, a small percentage of the prostate-specific antigen ends up being unbound while it circulates in the blood. And so, when the term bioavailable, or free, is used in the context of PSA levels, it represents prostate-specific antigen that is floating freely in the blood unbound to carrier proteins. Free PSA provides additional information when compared to the total PSA levels. Because of the detail the free measurement of the PSA blood test provides, PSA total and free levels are frequently measured by people who are at a higher risk of prostate cancer or simply want a more detailed analysis. A low ratio of free PSA to total PSA (under 15%) is correlated with a higher risk of prostate cancer. PSA levels are also measured in order to assess the relative risk of prostate cancer recurrence after treatment and, in this capacity, is sometimes ordered along with the prostatic acid phosphatase test. To get a PSA free and total test near you, simply place your order online and get your blood drawn at the Quest Diagnostics lab that you selected. Once your PSA free and total lab report is ready, you will be able to download it. As can be seen on the sample PSA total and free sample lab results, the PSA % free and total blood levels are reported as a number and can be compared against the reference range provided by the lab. Given its importance in men's health, the PSA free and total test is included in the men's health panel (age 40-49), men's health panel (age 50-59), and men's health panel (age 60+). PSA Free & Total Test at Guaranteed Prices.